Newcastle Gearbox and Diff’s reputation is built on QUALITY and SERVICE. We specialise in the repair of manual gearboxes and differentials for cars, 4WD’s and light trucks. In order to provide you with the best quality and value for money, we source our products from a number of world class suppliers including Exedy, NSK, Timken, NTN, NOK, Motospecs and many more. Service, repair and replacement of gearboxes and manual transmissions. Service, repair and replacement of transfer cases. Service, repair and replacement of differentials. Service, repair and replacement of clutches. Matthew Chandler and Mark Kent began the business in 1995. When we began there were only 3 employees in total. Mat and Mark struck up a good union with Mat running Sales and Mark running the workshop. This still applies today. We have grown over the years and now employ 10 staff. Matthew and Wayne are at the front taking care of customer service and administration, while Mark co-ordinates the running of the workshop floor and 7 staff. Wayne Fuller is the business manager and has been with the company since 1997. Matthew and Wayne’s combined parts interpreting and locating experience exceed 40 years. The combined mechanical experience of the team exceeds 50 years. Our original location was situated around the corner from our current premises. It was 300 square metres in size. We quickly outgrew it, and in 1998 we purchased our current building, just over 1000 square metres in size. We had the shop equipped totally separate to our old one, which meant we could literally close the doors, walk our tool boxes around the corner on a Friday and open for business in our new shop the following Monday. Our equipment includes 7 hoists that can handle up to 5 tonne capacity and what we consider to be a complete range of specialty tools for the specialised field we cater for. Here at Newcastle Gearbox and Diff, we have built our reputation for the past nearly 20 years on providing top notch gearbox and manual transmission repair and installation service to our clients, ranging from individual customers to vehicle dealerships and mechanics that rely on our expertise. 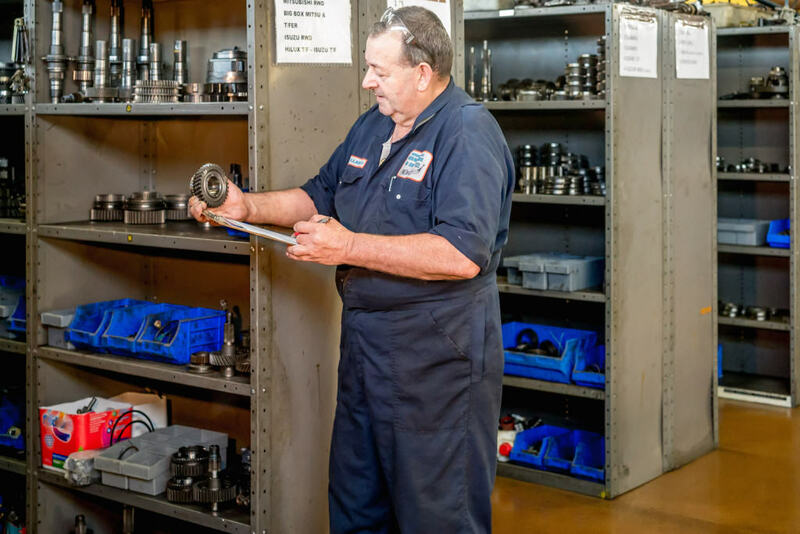 We make use of only the highest quality parts and the most experienced technicians to ensure that our customers receive the highest level of service possible with for any gearbox, differential or transfer case issues. Welcoming and helpful advice for car owners. Honest advice and competitive service pricing. Very efficient and precise assembly of gearboxes. Trusted by many local mechanics and car dealers. Specialised workshop layout, jigs and equipment. Exacting procedures and standards for accuracy. Wide range of new and used spares on hand. When our quality workmanship meets the quality parts that we provide to all of our customers, it creates a level of service that leads to the utmost satisfaction for our customers. All of the repairs and services we perform here at our fully equipped workshop are done by only the absolute best mechanics here in Newcastle. But thats not all; our workers aren’t just qualified. We’ve also got a ton of experience in doing all sorts of manual transmission and gearbox repairs on the most common vehicle brands here in Newcastle. Here at Newcastle Gearbox & Diff, we’re a qualified major distributor for Australian Transmission Components (ATCs) in the Newcastle area. This association provides us with a large stock of gearbox and manual transmission parts for a wide range of makes and models that we use to provide our clients with absolutely top notch service. We remove, disassemble, service, repair, refit and calibrate vehicle gearboxes every day, which has provided us with a level of confidence that allows us to provide consistent and effective manual transmission and gearbox service. We guarantee that your repair job will be done with the highest level of speed and efficiency possible. Newcastle Gearbox & Diff provides service to a wide range of areas in the Newcastle area. Located at Broadmeadow with easy access and plenty of parking, we make sure our clients can reach us as quickly and conveniently as possible, leading to their vehicle getting back on the road as soon as possible.